Hard Spun won four graded stakes and defeated 2007 Horse of the Year Curlin in both the Kentucky Derby and Haskell Invitational. The Danzig colt was the unanimous selection as Pennsylvania-bred Horse of the Year. Canadian shipper’s big victory came in the $75,000 Pennsylvania Nursery S. with a dominating five- length score. 4 starts, 2 wins, 1 second, earned $95,312. Winner of half her starts, and second in the $55,000 White Clay Creek S. at Delaware Park to divisional leader Proud Spell. 4 starts, 2 wins, 1 second, 1 third, earned $69,490. Winner of the King’s Bishop S-G1, Lane’s End S-G2, and Kentucky Cup Classic-G2 and Lecomte S-G3, second in the Breeders’ Cup Classic-G1, Kentucky Derby-G1 and Haskell S-G1, third in the Preakness S-G1. 10 starts, 4 wins, 3 seconds, 1 third, earned $2,572,500. Winner of the Prix Vermeille-G1 in France and E.P. Taylor S-G1 in Canada, and second in the Prix de Diane-G1. 6 starts, 4 wins, 1 second, earned $1,170,915. Impressive winner of first three starts-New Orleans H-G2, Mineshaft H-G3 and National Jockey Club H-G3-before being injured. 5 starts, 3 wins, earned $598,170. Three-time stakes winner, including a season-ending victory in the La Prevoyante H-G2 at Calder. 6 starts, 3 wins, 1 second, 2 thirds, earned $258,760. Unraced as a juvenile, he won three stakes in ’07, including the classic English St. Leger-G1 at a mile and three-quarters. 8 starts, 4 wins, 2 seconds, earned $1,033,373. Began the campaign with a win in the Royal Chase for the Sport of Kings-NSA1 at Keeneland, and followed with a win in the A.P. Smithwick-NSA2 at Saratoga. 6 starts, 2 wins, earned $159,215. Broke her maiden for $15,000 at Philadelphia Park in January, and finished her season with a victory in the $250,000 My Juliet S. under Russell Baze. 14 starts, 6 wins, 3 seconds, 3 thirds, earned $291,299. 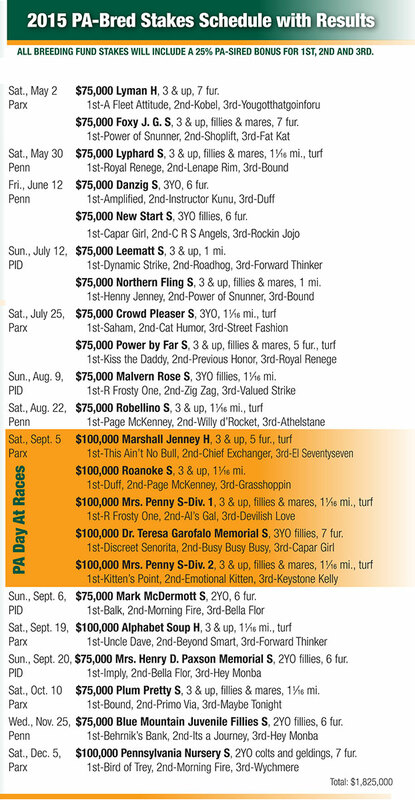 Dam of five foals to race, all winners, including Hard Spun (7 wins, $2,673,470, King’s Bishop S-G1, etc. ), Our Rite of Spring ($141,000, Exogenous S) and Wild Current ($273,218, 2nd Damitrius S, etc.). Arguably the fastest runner in the U.S. over the past two seasons. Won the Vosburgh-G1 by nearly six lengths before illness prevented an opportunity to confirm his superiority in the Breeders’ Cup Sprint-G1. 4 starts, 3 wins, earned $404,332. Total earnings of $2,636,006 in North America and Europe for horses bred by George Strawbridge Jr.
For the third time in the past four years, Total 2007 progeny earnings of $2,289,730.